One of America’s foremost energy experts says Canada’s controversial oil tar sands are getting a bum rap. Daniel Yergin, who became a go-to guy for energy wisdom after winning a Pulitzer Prize for his 1990 oil tome, The Prize, appeared on KQED’s Forum program today to promote his latest book, The Quest: Energy, Security and the Remaking of the Modern World. When host Michael Krasny asked Yergin about the Canadian tar sands boom and a plan to construct a pipeline to bring it into the US for refining, Yergin said the project “has become a huge symbolic target.” Indeed the controversial Keystone XL pipeline proposal has been a lightning rod for demonstrations at the White House and a target of ongoing protests across the country. But Yergin said he thinks the risks of importing tar sands oil from Alberta have been overblown. 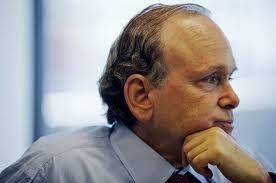 Daniel Yergin is a Pulitzer Prize-winning author and CEO of IHS Cambridge Energy Research Associates. Yergin also sits on a federal Dept. of Energy panel assessing the risks from the natural gas recovery method known as “fracking.” He downplayed concerns about effects on water quality but conceded that potential air quality impacts and the issue of “community impact” need more attention. The entire one-hour interview is posted at the Forum website. The Tar Sands issue needs to be investigated, I for one feel that Tar Sands will not help or assist in creating jobs here in the United States. I see this a a polluting issue which will not create jobs here and will damage our environment. This byproduct of oil will first go to the international market and not the US and will cause more damage to our air quality. I don’t agree this will create positive job growth. For a man who is a Pulitzer Prize winner, he sure sound like a typical lackey for the industry. Trying to scare us by saying it will go to China is very insulting. Wow. Talk about a shill. It’s about time we really started to do what will save us: reduce our energy use. Yeah, sure, no one will. That’s because the government refuses to even try to say that. If Obama and his administration did a program to really reduce our energy use, using the FACT that our economy would be saved just by reducing our use 10%, it would work. 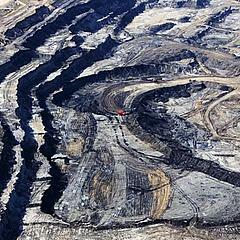 The tar sands are an environmental disaster. @Patrick, as a native(I may be caucasian but I was born here) Canadian and long time Albertan I agree with you that piping raw bitumen to the states would not create jobs that someone like you could do. Please continue protesting the keystone line so they will be forced to build more upgraders and refinerys here where I live. After your country dragged mine down into a recession I lost my home due to lack of work and am still having trouble securing steady work. Say no to Keystone! You don’t want steady jobs in the trades! It’s too much like actual work! Become enviromental bums and protesters instead! I think California oil should receive the same scrutiny as Alberta oil sands oil. It is almost as heavy and has an equivalent wells to wheels CO2 footprint as oil sands oil. The oil from Canada will be upgraded at US gulf coast refineries. This will definitely add more jobs, but more importantly, will fill the heavy oil requirement of the refineries heavy oil processing with oil from your neighbor to the North, rather than from Chavez, Saudi princes, or other OPEC countries. Blocking the pipeline will do NOTHING to reduce CO2. It will eliminate a secure supply of oil using safe and reliable pipelines necessitating the tanker shipping of oil from countries with NO environmental laws or public disclosure. Just heard the interview from Mr. Yergin and would like to congratulate him on having a fair and enlightened view of the Canadian oil “SANDS”. The enviro-nazis have used the oil sands as a lightning-rod for their agenda to shut down the oil based economy the world has used for the last 100 years. While I appreciate the efforts to introduce new cleaner energy sources, the simple fact is that wind and solar will take quite a few more years/decades to even come close to the energy stored and released from oil and oil products. Until we all stop driving cars, planes, trains, buses and refuse to have anything to do with the thousands of products that are made from oil, we will need oil from locations such as the oil sands. Massive amounts of money are being spent as we speak to continually lower the environmental impact of the oil sands. In some few ways the impact of the environmentalist movement is good as it has given the oil industry a strong incentive to continually research and find ways to lower the impact of mining oil. I just wish the nay-sayers would stop using ridiculous arguments about a soon to be realized solar or wind powered world when they conjure up reasons to shut down the oil sands. Frankly, thank God the oil sands are in Canada and not some goofy middle eastern “kingdom”. And finally, the oil reserves in the Oil sands are much larger than the 179 billion barrels claimed. That figure is just the top, easily harvested oil. Actually, the oil sands just go deeper and deeper. I think most Canadians would much sooner sell our oil and energy surplus to the US than China. However, there is currently a great deal of Chinese money being invested in the Alberta and Saskatchewan oil sands. If we can’t sell to our natural allies and neighbours, we will have to sell our wares elsewhere. By the way, when Americans debate the pros and cons of buying our oil, I never hear anything about the great deal of money US investors have made by investing in the Canadian oil and Gas industry. Good for them. The processes and cost of recovery gets lower and lower as we increase research and capitalize on new and better means of getting the oil from the sands.